It has been cold here! Really cold! The term the weather forecasters are using for this extended period of chilly weather is “polar vortex.” Whatever it’s called, it does not compel me to go outside for long periods of time. What to do? 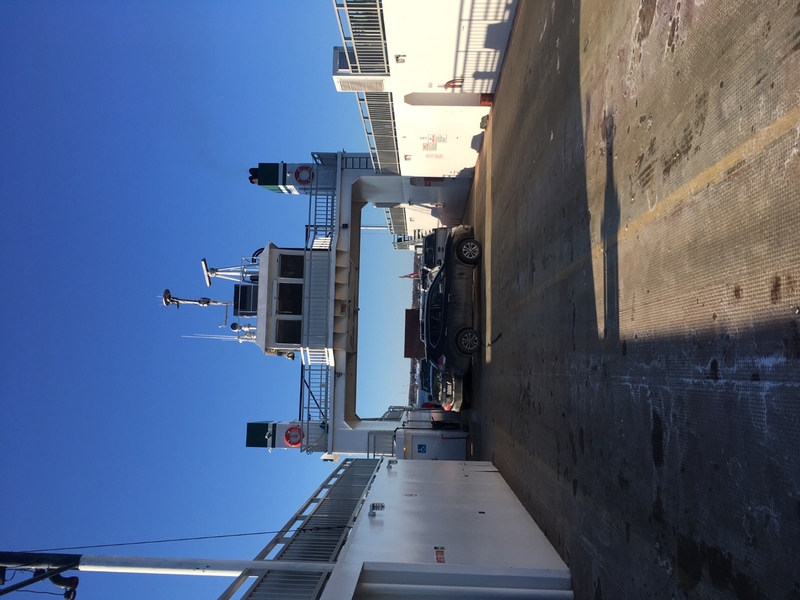 What about a last minute boat cruise on the Frontenac 2 ferry over to Amherst Island. I can look for owls from the warmth and comfort of my little car. 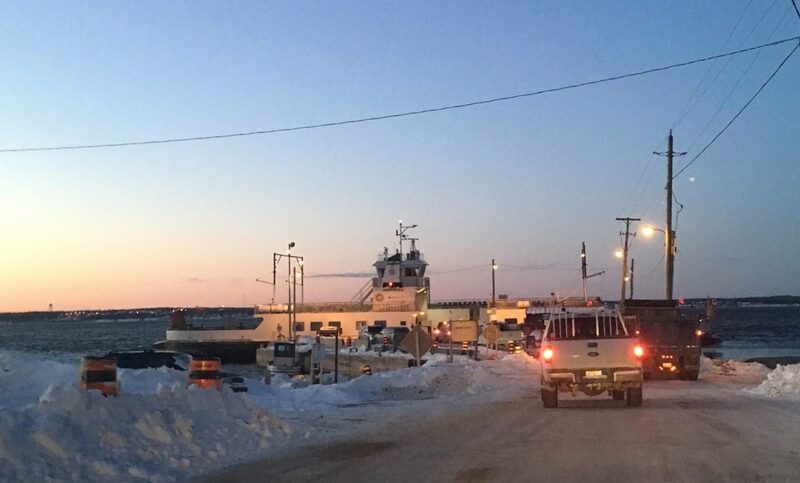 Here’s the ferry. You can see my little Honda Civic on the left side. 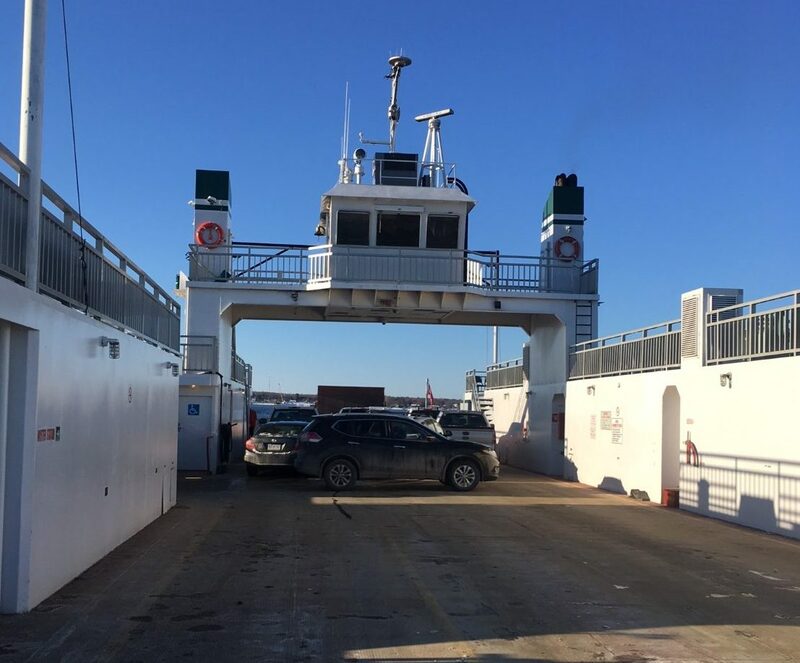 The Frontenac 2 is the only ferry I know where you drive in forward, and have to back up and swing around to drive off. 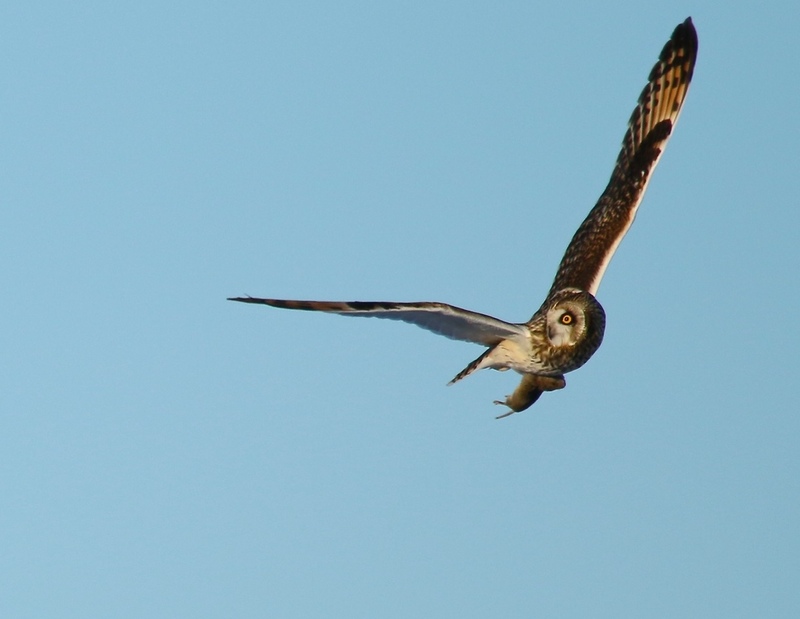 I heard a call over to my right, and all of a sudden a shortie flew right over the road past where I was standing, with prey in its talons. 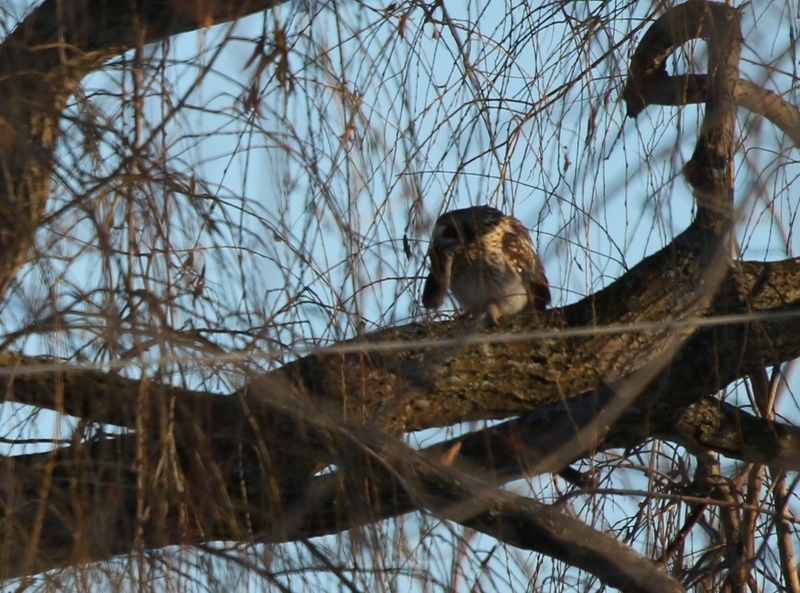 A quick look around with its piercing yellow eyes, and it flew across to eat in a big tree. Mealtime. 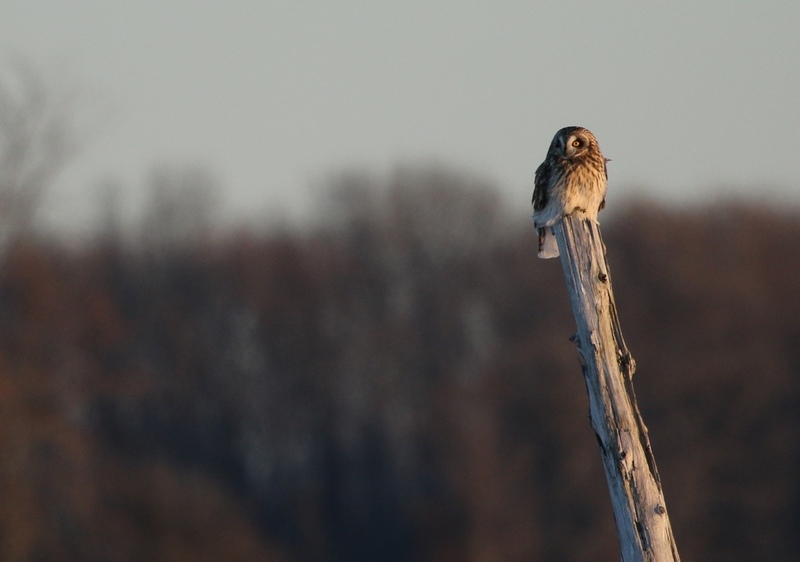 As I was watching this spectacle, a couple of guys came along who told me that they had seen a short eared owl on the north side of the island. I left this one to have its meal, and carried on. As I was driving I saw this one flying around a field and then landing on a post. 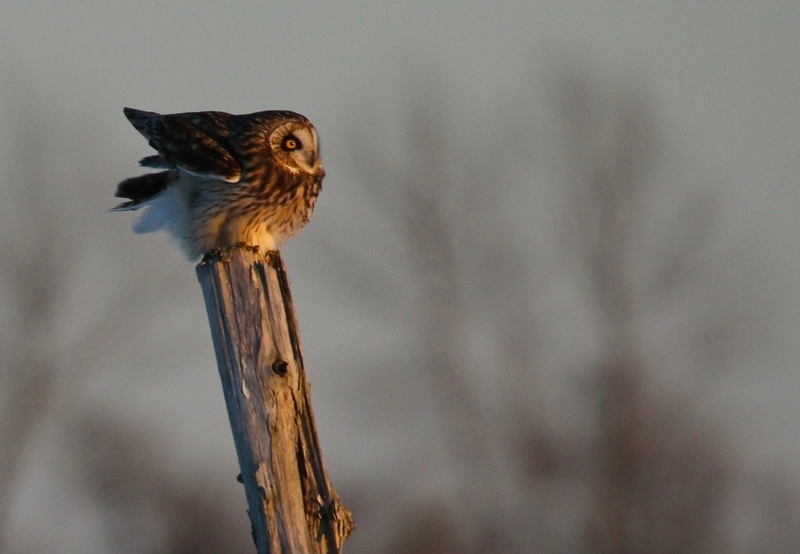 As fluffed up as it was, this owl did not seem to mind the cold at all. 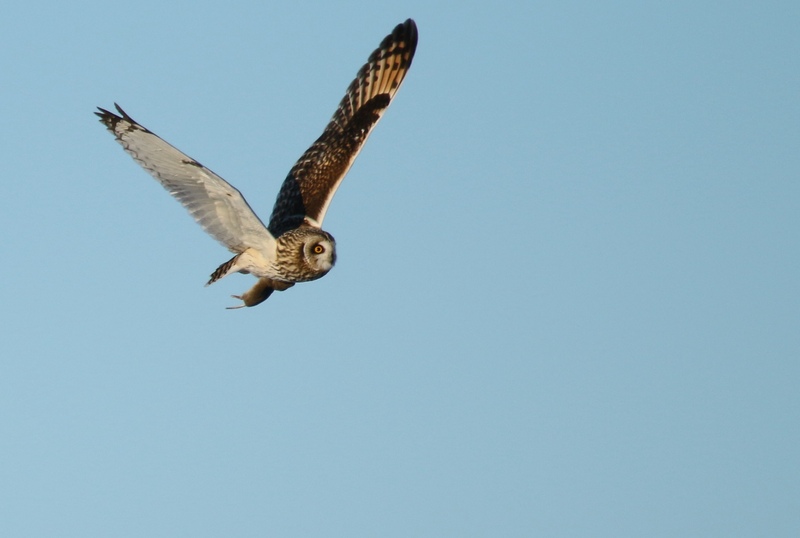 Did you know that Short Eared Owls live on every continent except Antarctica? They must be very adaptable! 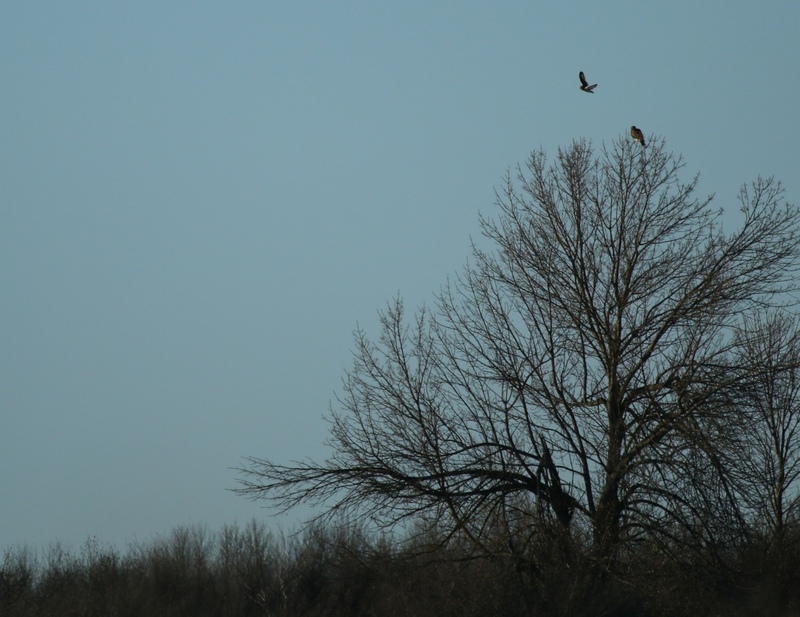 I have heard a lot about how these owls fly, but had never had a chance to watch until now. Their small bodies and long wings make them buoyant and beautiful as they fly. Here’s where I fell into the ditch! The snow was pretty deep. Nice shot. 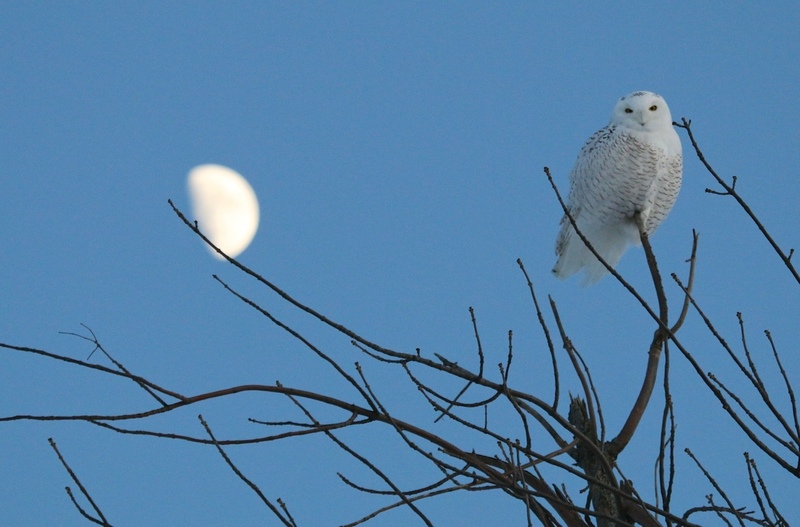 On my way back out to the ferry Snowy Owls started popping up where I had never seen them before. 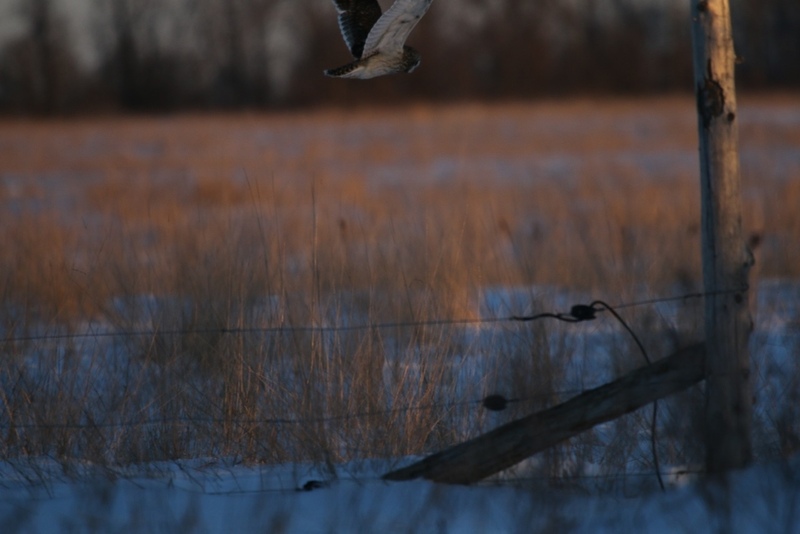 As the sun goes down, these white ghostly owls come out to hunt. 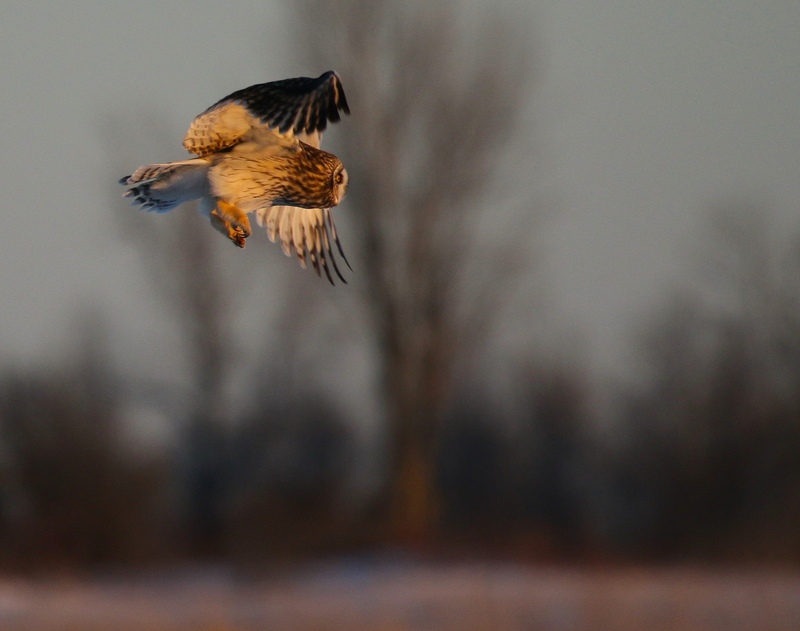 Overall I believe I saw 6 Snowy Owls and 6 Short Eared Owls on my little safari to Amherst Island. 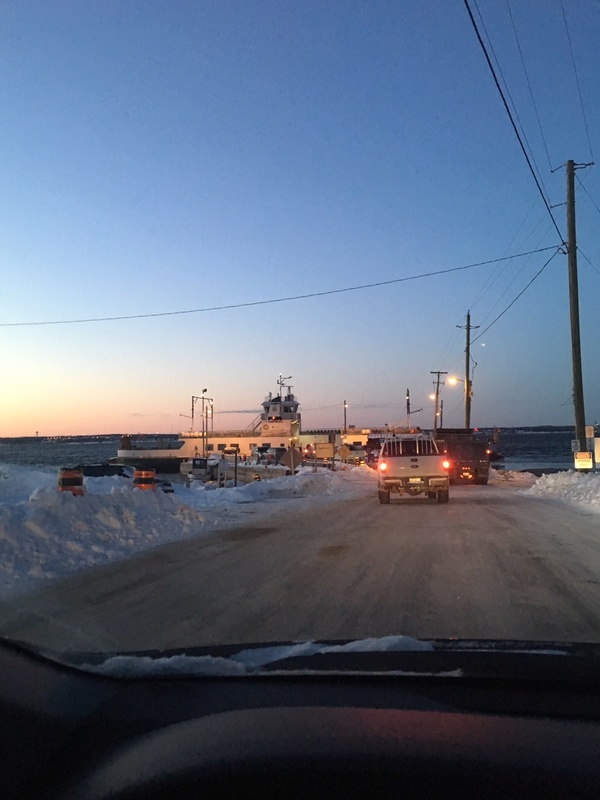 I made it to the 5:00 pm ferry, just as most of the light was going out of the sky. 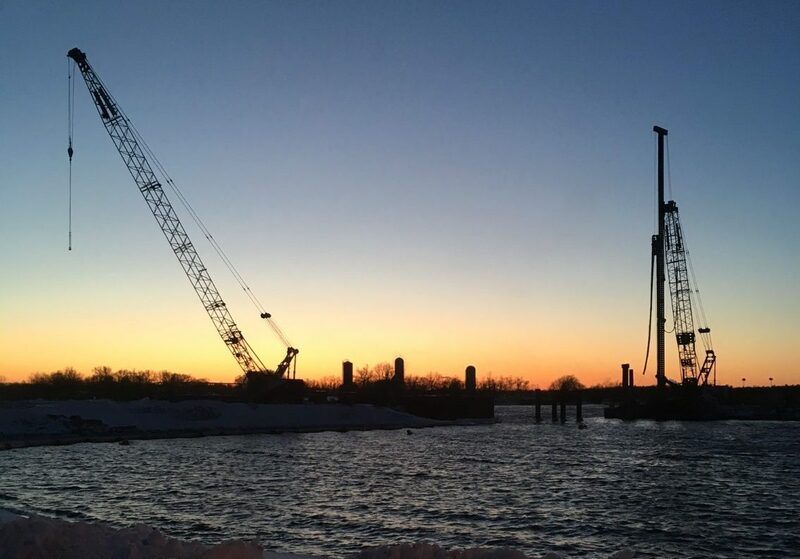 As I looked back on Amherst Island I could see the shapes of silos, surrounded by the cranes they are using to build a new ferry dock facility. 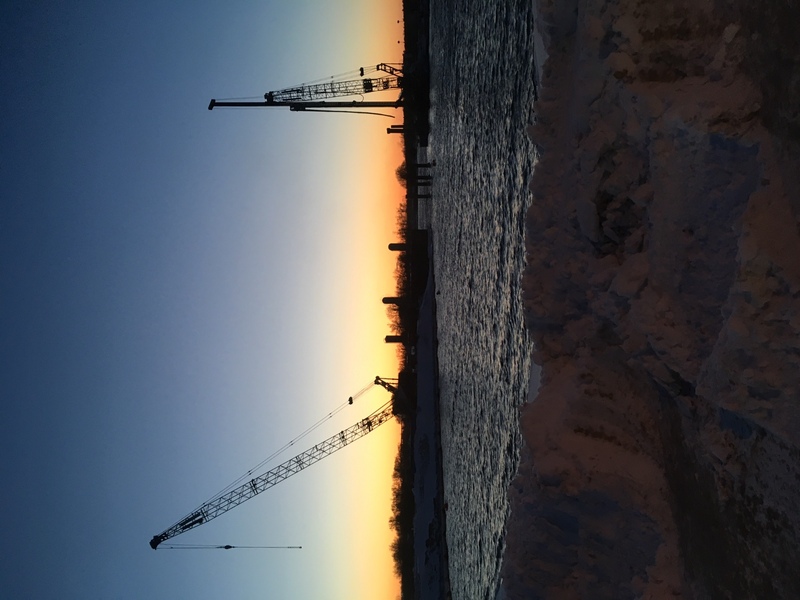 A couple of dozen wind turbines are being constructed on Amherst over the next few years, and there is construction all over the island. But that’s another story. Amherst Island is only a 60 minute drive and a 20 minute boat cruise away from my house. I sometimes wonder why I don’t go there more often. It’s amazing. Totally amazing Leslie…you are definitely obsessed in a very artistic way. So appreciate your dedication! Fantastic photos! Many thanks for posting these, and for making the trip! Happy New Year to you and your family! Happy New Year to you too! Hope to see you back at the beach for the Piping Plovers this summer. I loved this post and again your photos are stunning. I even loved the reality check… somehow I would never envision Leslie falling in a ditch :-). It was however very sad to read about the developments on Amherst Island. It sounds like this has been an excellent habitat for the birds but with wind turbines and construction it will be lost too. To read about and see the birds you saw makes one realize just how much is at stake and sadly this is just one of many such areas. Despite the construction the birds are carrying on their lives. My hope is that there is room for both birds and clean energy. Thank you, Leslie. You are a bright light in these frigid days. Wonderful pictures, as always. Thanks Cathy. The sun is nice, though not too warm at the moment. Beautiful photos . . . interesting commentary . . . brave adventure in frigid weather. Methinks that falling in ditches is hereditary! Yes it is. But at least we climb back out again. Hi Nicola- I fall a lot. But I always get up. 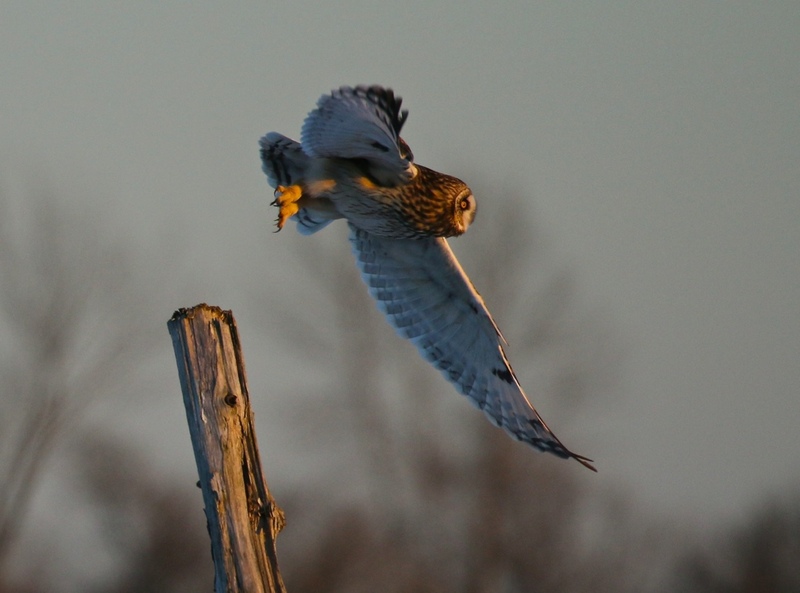 Any owl action around your place?